At the age of eighteen, Patrick Leigh Fermor set off from the heart of London on an epic journey--to walk to Constantinople. A Time of Gifts is the rich account of his adventures as far as Hungary, after which Between the Woods and the Water continues the story to the Iron Gates that divide the Carpathian and Balkan mountains. Acclaimed for its sweep and intelligence, Leigh Fermor's book explores a remarkable moment in time. Hitler has just come to power but war is still ahead, as he walks through a Europe soon to be forever changed--through the Lowlands to Mitteleuropa, to Teutonic and Slav heartlands, through the baroque remains of the Holy Roman Empire; up the Rhine, and down to the Danube. At once a memoir of coming-of-age, an account of a journey, and a dazzling exposition of the English language, A Time of Gifts is also a portrait of a continent already showing ominous signs of the holocaust to come. 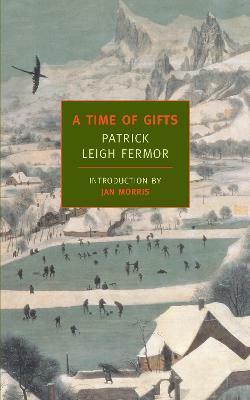 Patrick Leigh Fermor (1915-2011) was an intrepid traveler, a heroic soldier, and a writer with a unique prose style. After his stormy schooldays, followed by the walk across Europe to Constantinople that begins in A Time of Gifts (1977) and continues through Between the Woods and the Water (1986), he lived and traveled in the Balkans and the Greek Archipelago. His books Mani (1958) and Roumeli (1966) attest to his deep interest in languages and remote places. In the Second World War he joined the Irish Guards, became a liaison ofﬁcer in Albania, and fought in Greece and Crete. He was awarded the DSO and OBE. He lived partly in Greece--in the house he designed with his wife, Joan, in an olive grove in the Mani--and partly in Worcestershire. He was knighted in 2004 for his services to literature and to British-Greek relations. Jan Morris was born in 1926, is Anglo-Welsh, and lives in Wales. She has written some forty books, including the Pax Britannica trilogy about the British Empire; studies of Wales, Spain, Venice, Oxford, Manhattan, Sydney, Hong Kong, and Trieste; six volumes of collected travel essays; two memoirs; two capricious biographies; and a couple of novels--but she defines her entire oeuvre as "disguised autobiography." She is an honorary D.Litt. of the University of Wales and a Commander of the British Empire. Her memoir Conundrum is available as a New York Review Book Classic.